Today is the day! 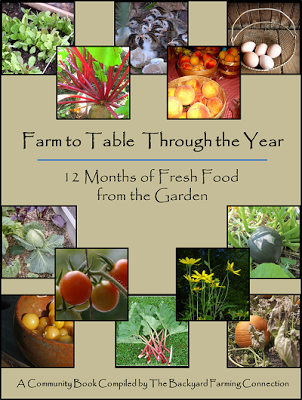 You can download your free copy of Farm to Table Through the Seasons. Farm to Table Through the Year is a culinary and gardening journey through the 12 months of the year with growing tips, first hand growing information, recipes, and photos to inspire you in your own backyard and in your kitchen this year. This e-book is a collaboration of some pretty amazing bloggers and came together with the hard work and dedication of Gretchen from The Backyard Farming Connection. I am honoured to be a part of it and am so excited to be sharing it with you today. Download your copy of Farm to Table Through the Seasons and let me know what you think. This is impressive Kim- thank you so much for sharing- so much great info. Can't wait to get my hands dirty! Thank you! Happy to share it with all of you. I can't wait to get my hands dirty too..bring it on! So very cool! Can't wait to delve into it. Oh, I'm so looking forward to this. Thank you! So nice, thank you for sharing. Can't wait to get into it. Happy to share, hope you enjoy it. Hi, I found you through some other blogs (Lady Cordelia and some others). Thanks for the free book! Thanks for stopping by. Hope you enjoy the book. Thank Kim! I look forward to checking it out. You are very welcome Lisa, enjoy it! Hope you enjoy it Sara. Thanks Kim! I look forward to reading through it tonight. My pleasure, happy to share. this looks really interesting. can't wait to check it out. Thanks! I can't wait to give it a read! !